Thank you, MySQL Engineering Team! I dunno Kaj, this might cause even more controversy in our numbering system! I could totally see the beer drinkers calling for more "point" releases and the shot drinkers calling for more major releases! "Five shot three" instead of "six shot - oh"! Now the question begs, Kaj -- which order will you drink them in? So out of "1) Invite 5 friends for a toast or 2) have 5+1 drinks yourself", you apparently chose the second option? Very Finnish. Did I tell you the joke about a Finnish game, where you drink vodka and then try to guess who went outside the room? 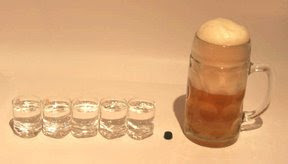 Drinking 11.5 litres of beer would be too much for most people and the 3 shots of vodka would have been long forgotten. This is a beautiful recipe for our celebrations. The rule should definitely be to drink all 5 shots in a row and then enjoy the beer. Awesome, but as the only non-beer drinking in the bunch, I have to admit I'm looking forward to 6.0 even more so now than ever! Very nice! I am just wondering how you will celebrate updates like MySQL Enterprise Server 5.0.72?